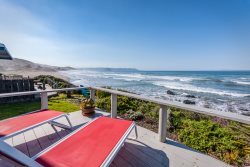 Beautiful modern and new home in the heart of Cayucos with breathtaking oceanviews! Steps to the beach, and a brisk walk to downtown Cayucos pier, shops, and restaurants. (051) Ocean Air was built in 2010 and features an open gourmet kitchen, large granite center island and a spacious floor plan. Enjoy watching the sunset from the second story viewing deck, or find yourself soaking up the sun in the enclosed patio. Whatever brings you to Cayucos, this home will absolutely be the perfect space to gather and make new beach memories. IMPORTANT NOTE: This home will be listed for sale in the summer months.